More than three quarters of motorists (76 per cent) say potholes should be filled in within a week of being reported, according to a survey. 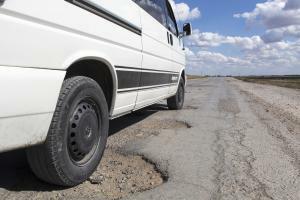 The poll of 18,000 motorists was commissioned by the AA and also found that one in five (18 per cent) felt that a pothole should be fixed within 24 hours. Currently, councils are expected to fill the deepest and most dangerous potholes within a few hours, but those that are more minor are generally left. This means drivers sometimes have to endure rutted roads for months at a time. In the AA’s new report, resident Edmund King called for the ‘worsening condition of our road network’ to be addressed quickly to prevent deaths of vulnerable road users such as cyclists and motorcyclists, and to reduce compensation payouts for vehicle damage. ‘It can’t be right that one council could fill a lower-risk pothole within three weeks, while a neighbouring council needs four weeks,’ Mr King said. ‘Councils should have a back-stop deadline, but with emphasis on carrying out the repairs quicker. However as recent studies have found, local authorities need more than £12 billion to bring the road network up to scratch, and until that time the reality is the cost of repairs exceeds the budget give to councils to repair them.